This utility will copy the specified columns or rows from each selected sheet, and combines them into a new sheet. You can for example put the data from F of each selected worksheet side by side on a new worksheet. 1. Select the desired worksheets from which you want to combine the data. 2. Start this utility and then select the column(s) or row(s) you wish to put together. If you choose the option "Create dynamic links (cell references)", the new worksheet will contain formulas with a cell reference to the original data. If you choose this option the display of zero values on the new worksheet will be turned off. 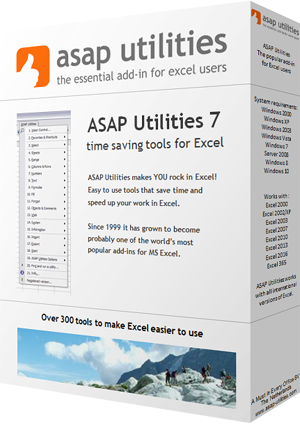 The display of zero values is an Excel worksheet setting which you can also control with the "Vision Control" utility in ASAP Utilities.